Church building description: There has been a church on this site for over 900 years. Much of the Saxo-Norman masonry survives, there is a fine painted screen and medieval pew ends. 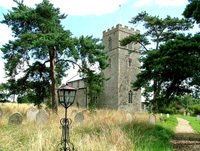 This church is in the Parish of Saxthorpe with Corpusty, Matlaske Benefice and the Holt Deanery.